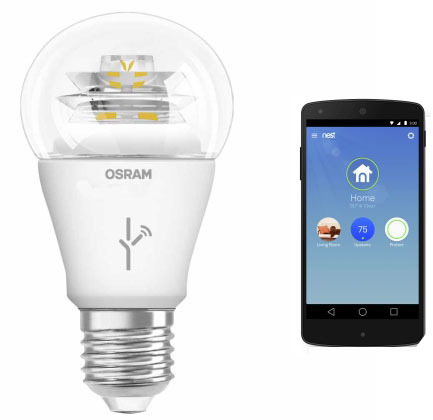 As Osram seeks new buyers for its lamp business, it has reorganized its product category, making its Lightify range of smart LED lamps compatible with Google Nest home control system. Osram said the Lightify line has joined the "Works with Nest" program in the UK and Ireland, with other countries to follow soon. Interested in more articles & announcements on smart LED lamps and controls? Osram makes its Lightify range of smart LED lamps compatible with Google Nest home control system. Lightify is Osram LED lighting in what the residential market calls "smart bulbs" that do things generally not possible with traditional lighting. Users can use apps on their phones and tablets to turn lights on or off, brighten or dim them, or change colors to suit moods — all from the same room as the lights, or from around the world via the Internet . Consumers can also program them in advance to do those things at certain times of the day, or to flash as security alarms, smoke detectors, sports or stock price alerts. With the new deal in the UK and Ireland, Osram users now have the choice of tying those smart LED lamps into Google Nest thermostat and home automation device, which wirelessly connects to boilers, furnaces, doors, lights, washing machines, and phones, among other items. Nest is potentially a key hub in the latest Internet of Things (IoT), allowing people to program and operate appliances from afar, and to set up "if-then" scenarios (if an intruder walks in, flash the lights and sound the alarm, for instance). "Nest users can use any product within the Lightify family to create scenes and integrate them with the home and away scenes of Nest," Osram said. "When using the home and away functions, users can choose from any of their existing Lightify scenes." Rival smart LED lamps include Hue from Philips, Link from GE, the Connected Cree LED Bulb, the LIFX bulb from the eponymous Redwood City, CA startup, and others. Philips has extended Hue capabilities into the entertainment world, syncing lighting to match the action in the TV series in the name of "12 Monkeys". Smart bulbs cost a lot more than a standard LED lamp. Osram lists the Lightify lamp in the UK at £40 (about $60) for a full color-changing model. The Tesco website is selling Lightify lamps for between £25 and £31 depending on the version, while Osram "standard" LED lamps generally sell for between £6 ($9) and £10 ($15) depending on the model and packaging. Lightify also requires a small gateway box that plugs into a wall socket and serves three purposes — it receives instructions from the app, transmits instructions to the light, and sends and receives commands to and from the Internet via a wireless connection. Tesco is selling the gateway for £40. Market research firm ABI late last year forecasted that suppliers would sell a quarter of a billion smart bulbs annually by 2020. Meanwhile, as Osram announced in April, it "aims to transfer the general lighting lamps business into an independent structure. "The transaction could include selling the $2.5B general lamp business. Big lighting player Philips is attempting a similar move. Some experts also expect GE to sell off its conventional lighting and home LED operations after its recent reorganization in which it moved commercial LED lighting into a new energy services division called Current, Powered by GE.